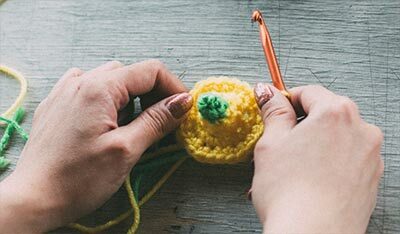 Here's a great Knit project, whether you've got years of experience or you're just starting out. Brushed mohair-type yarn —10 oz. Size 9 NEEDLE OR SIZE NEEDED TO OBTAIN GAUGE. 4 sts = 1”; 12 rows = 2” in pat. TO INSURE PROPER SIZE, BE SURE TO CHECK YOUR GAUGE. Shawl measures approx 90” across top, 25” down center back, without fringe. 8 sts. Row 5: Inc 1 st in first st, p to last st, inc 1 st in last st — 10 sts. Row 6: Inc 1 st in first st, p 4, inc 1 st in next st, p 3, inc 1 st in last st — 13 sts. Row 7: K 1, *yo, k2tog tbl; rep from * across. Row 8: Inc 1 st in first st, p 1, inc 1 st in next st, p to last 3 sts, inc 1 st in next st, p 1, inc 1 st in last st. Rows 9 & 10: Inc 1 st in first st, p to last st, inc 1 st in last st. Rep Rows 7-10 for pat rep (each rep adds 8 sts) until top of Shawl measures 92”. 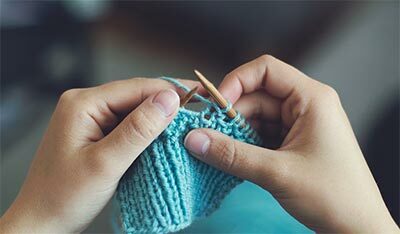 Bind off in pat Row 9.
crochet hook through back of work, drawing loop through, then bring ends through loop and tighten. Attach one fringe to point at center back and one fringe on each side, then one fringe in end of each row along lower edges. Trim fringe evenly. 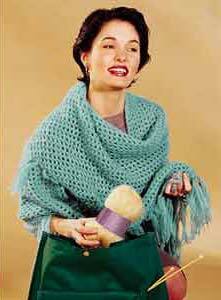 The Shawl pictured in Cosmopolitan was not provided by Craft Yarn Council of America.